Elastics have made a come back! As well as a form of fitness, physical development, co-ordination and enjoyment, this resource offers many and varied original ideas and activities not experienced before on how to use individual elastics, looped elastics, large elastics and co-op bands. This is a PDF that you will receive as soon as your order is placed. 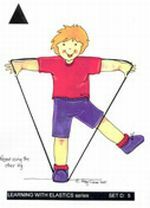 There are 32 x A4 sized full colour illustrations in the set, showing a variety of balances, body positions, geometrical shapes and spatial awareness experiences using the Individual Elastics. This is a downloadable item that you will receive as soon as you place your order, so you can print it yourself!